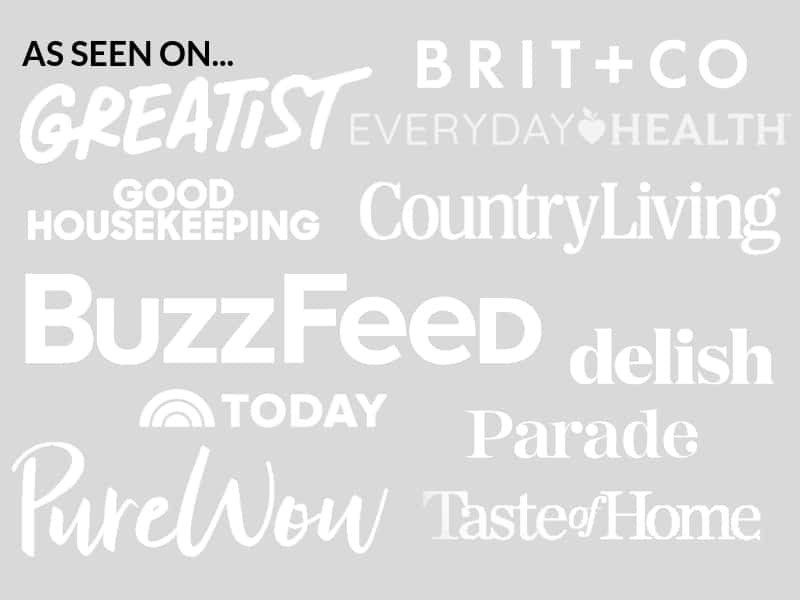 December 6, 2018 By Elizabeth Lindemann 8 Comments / This post may contain affiliate links. 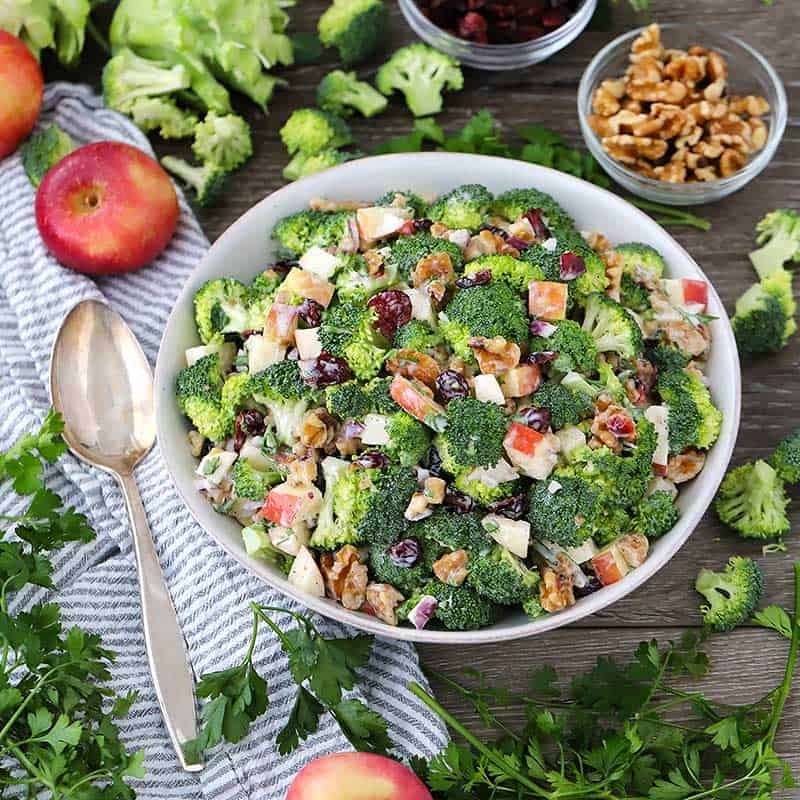 This Broccoli Salad is packed full of delicious, healthy ingredients like sweet apples, crunchy walnuts, and tart cranberries, tossed in a sweet and creamy dressing. It’s a major nutritional powerhouse and tastes absolutely amazing, and it’s the perfect make-ahead side or meal-prep lunch since it keeps well in the fridge for a few days. 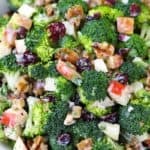 This broccoli salad is sweet and tangy, the texture is crunchy, and everything is balanced out with the sweet, tangy, creamy dressing. This would be a GREAT addition to your holiday table (it’s especially festive for Christmas because of the green and red colors! ), or for a picnic/potluck. Plus, it’s one of the few salads that you can make, and dress, in advance, without fear of it getting immediately soggy. In fact, the flavors marry as it sits, so it’s best to eat it a few hours or a day after making it (after that, it may start getting a bit more soggy). Let’s talk for a bit about how nutritious this is. It’s a bit ridiculous, actually. First, broccoli. We all know it’s good for us, but it’s sometimes a bit difficult to eat, especially raw. 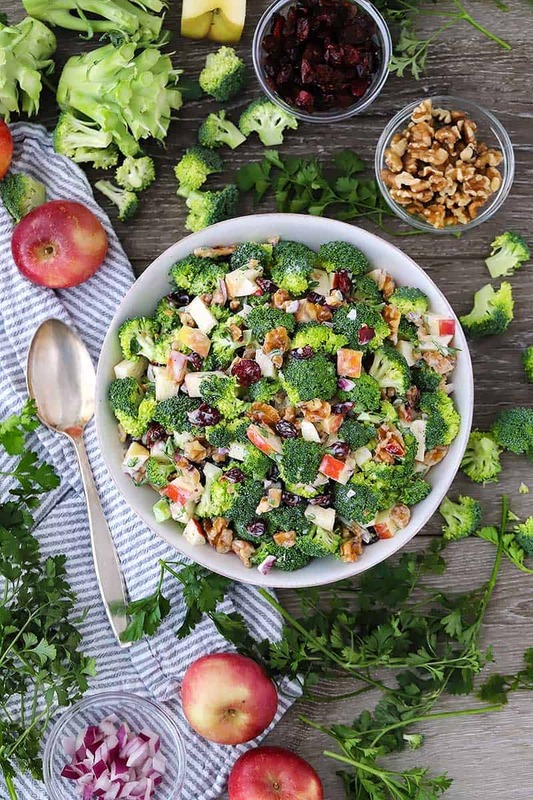 This salad is the perfect way to eat raw broccoli, since the sweetness of the apples and the honey in the dressing balance out its natural bitterness. It’s FULL of vitamins and minerals (especially K and C), as well as high in fiber. This may even be a great way to get your kids to eat it! Walnuts add protein, healthy fats, and a variety of minerals to the salad, and apples add vitamin C and fiber. With all the vitamin C, this recipe is a great alternative to citrus fruits to build your immune system during the flu season! 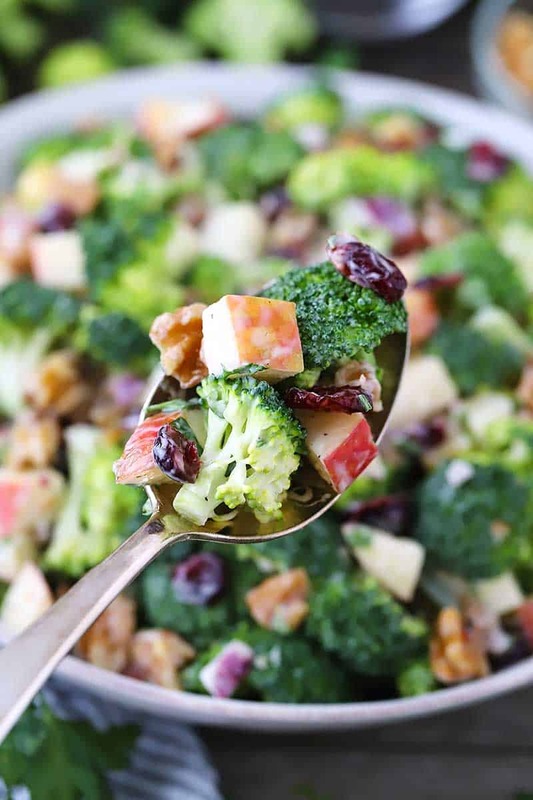 Finally, cranberries add an antioxidant boost in addition to vitamins C and E.
This broccoli salad is an immune-boosting, fiber-packed, plant-based powerhouse. The recipe calls for a cup of mayonnaise, which you may or may not think is a healthy addition since it’s high in fat, but bear this in mind: this recipe feeds about 8 people (you’ll only need a little bit to feel satisfied), and you can substitute all or some of it with plain yogurt, which will cut the fat in half even if you use whole milk yogurt (see notes in recipe below). And if you’re vegan, you can easily substitute the mayo with your favorite vegan mayonnaise. And if you want to really be an overachiever, you can make your own mayonnaise with olive oil and fresh eggs (it’s easier than you think!). The dressing is simple and delicious and sweet and tangy. Mayo is the base, with honey, apple cider vinegar, salt, and pepper whisked into it. You may want to try it on potato salad or chicken salad, too. Just whisk the ingredients for the dressing together in a large bowl and add the rest of the ingredients on top. Stir together, and you’re good to go! The broccoli salad recipe seriously couldn’t be easier to make. A lot of salad recipes suggest that you mix the dressing in a separate bowl and pour on top. I almost never do that- just use one bowl instead of two. Fewer dishes! Woo hoo! This salad meets the requirements of many dietary restrictions, including paleo, gluten free, dairy free, grain free, and vegetarian. All the more reason to bring it to a potluck or party, especially if you need to accommodate for certain food sensitivities or preferences. ALSO, it’s a great recipe that you can make ahead of time! 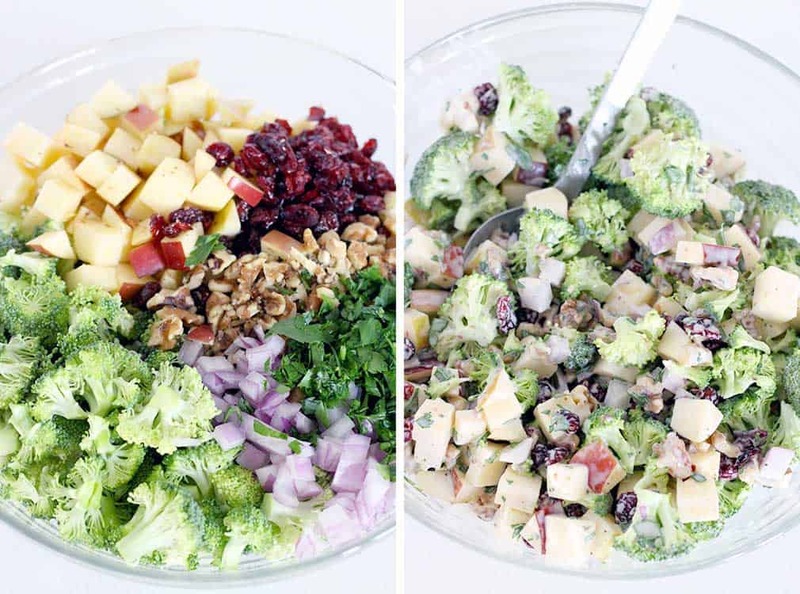 Lettuce-free salads always hold up better, and this broccoli salad recipe keeps for a few days in the fridge. I actually do recommend making it an hour or so ahead of serving, since the flavors will marry together as it sits. And since you serve it cold, you can literally take it out of your fridge and serve it right away without any fuss. It’s best to consume it within 1-24 hours after making it. It will stay good after that in the fridge, but it will start to become a bit soggy (since the salt in the dressing will draw out the moisture from the fruits and veggies). 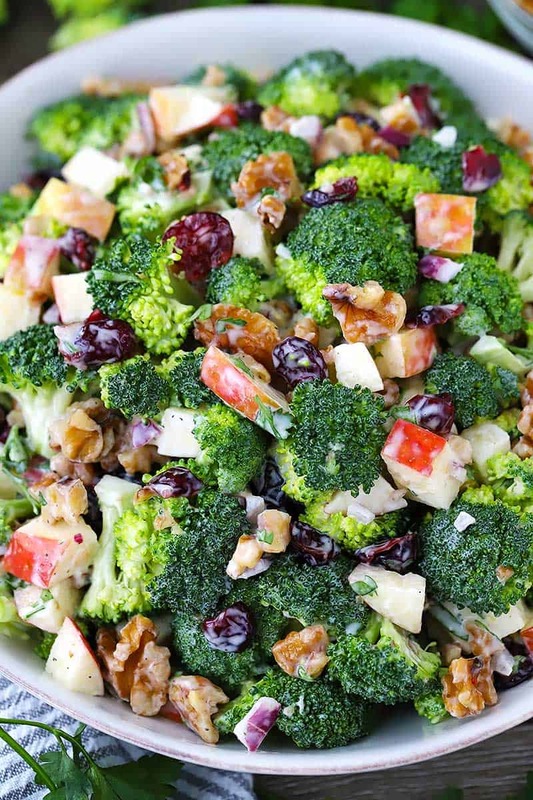 One last thing- broccoli salad is often made with raisins. Feel free to use them in place of the cranberries if you prefer! If you need another way to make broccoli delicious, try this Steamed Broccoli with Soy Mayo Dip, this Chicken and Broccoli Linguine with Lemon Butter Basil Sauce, and this Broccoli Avocado Soup. 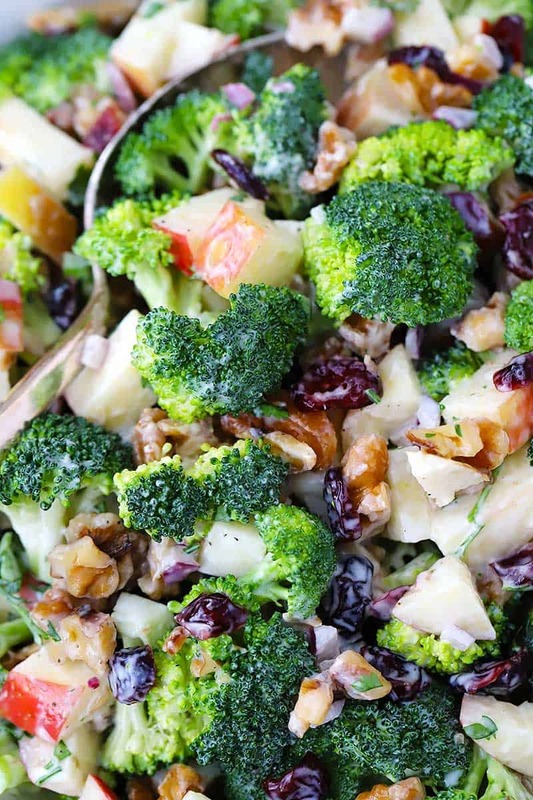 Recipe for Broccoli Salad with Apples, Walnuts, and Cranberries below! In the bottom of a large mixing bowl, whisk together mayonnaise, honey, apple cider vinegar, and salt and pepper until smooth. Add the remaining ingredients; stir well to coat. This post first appeared on Bowl of Delicious in October, 2016. I've updated the recipe and post with new photos and revisions. This recipe can be served immediately, but the flavors improve after a few hours in the fridge. It will keep well for about 24 hours in the fridge- after that, it may be a bit soggy. You can substitute some or all of the mayonnaise with plain yogurt- regular or Greek will work fine. You may need to add a bit more than one cup, since it doesn't have the same consistency as mayo. For a vegan version, use your favorite vegan mayo. For a nut-free version, use sunflower seeds instead of walnuts. This is delicious! The only change I made was raisins instead of dried cranberries because that’s what I had. Thank you for this great recipe! So happy you liked it! Raisins are a perfect substitute. Thanks for your suggestion! What is the nutritional value in the salad? Especially interested in the carb count. I’m on a low-carb low-sugar diet, and I know that dried cranberries can add a lot of carbs and sugars. So I’m sure I can make it without the Cranberries. It looks delicious, thank you very much! Hi Theresa! I’m in the slow process of updating my old recipes to have nutrition information. I went ahead and updated this one thanks to your comment! Assuming 8 servings in the salad, it looks like there are 21.2 carbs and 10.6 grams of sugar. The biggest culprits are the honey, apples, and cranberries. I think the broccoli tastes awesome with just a little bit of sweet, since it’s naturally bitter. I suggest omitting two of those things, so you still have a little bit of a sweet taste, to lessen the carbs and sugar. I’d leave the apples, since they are crunchy and delicious! Hope that helps! I have SO much to do tomorrow for a dinner. 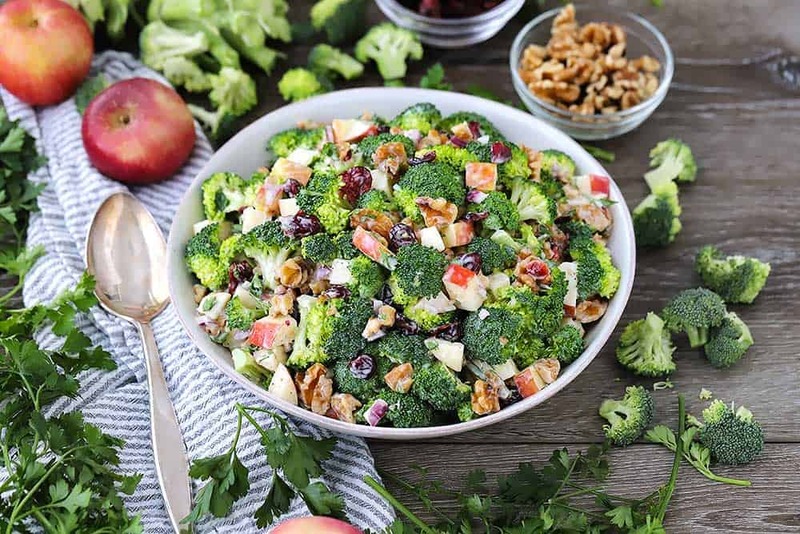 Can I make broccoli apple salad today?? HELP!! Definitely! Make sure to put it in an airtight container or press plastic wrap on the surface so the apples don’t brown too much. Good luck with your dinner! Thank you X’s a bazillion¡!!!!!! !